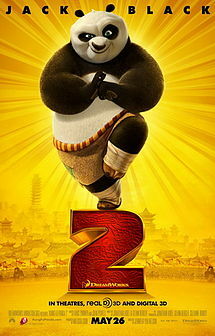 Po, our favorite Dragon Warrior, is back in Kung Fu Panda 2. Unfortunately for our plump protagonist, his newfound kung fu awesomeness is threatened by Lord Shen (Gary Oldman), a diabolical peacock. Yes, who knew a bird could be so wicked? Much like King Herod (or maybe even Lord Voldemort), he believes a sheep soothsayer's (Michelle Yeoh) prophecy that he will be killed by "a warrior in black and white", and commits pandacide with the help of his vicious wolf minions. Or so he thought. Through hand-drawn animation, we find out in flashbacks how Po ends up the son of the loving noodle-maker Mr. Ping (James Hong), a goose. Once again, the film is a visual triumph, with different styles of animation. But what stands out is its message of finding and accepting one's self, and how family and kinship can have nothing to do with blood and DNA, but everything to do with love and nurturing. One is not a parent, until you become one. Happy Father's Day to all the good dads in the world!